Today is my birthday, and I would like to honor my own mother by sharing one of our favorite books: A Birthday for Frances. Just thinking about this book now puts a huge smile on my face and reminds me of all the wonderful times I had reading together with my mother when I was little. Reading the Frances books made us laugh as a family, made us remember that none of us are perfect, and best of all made us feel loved. So, Mom, here's a Chompo Bar for you on this special day. It's Gloria's birthday, and big sister Frances is having a hard time. She tells her imaginary friend Alice, "That is how it is, Alice. Your birthday is always the one that is not now." Oh, how I could relate! It's so hard when it isn't your birthday. But Frances is sure, just sure that no one understands her. Frances does decide - a bit reluctantly, for sure - that she should buy Gloria a present with her allowance. She decides on on Chompo Bar and four gumballs. But that Chompo Bar, oh that Chompo Bar just looks sooooo good. Does she really want to save it all for Gloria, or should she take just one taste? I think what I like best about the Frances books is that Russell Hoban captures how these small moments are truly hard for kids. And yet, he infuses his stories with humor and compassion, so you can laugh at Frances at the same time as knowing just how she feels. As my own mother read this to me, I knew that she could tell how I felt, that she loved me know matter if I ate my brother's Chompo Bar or not, and that there would be a hug waiting for me when I was ready to come out from under the kitchen table. Thanks, Mom, for infusing my life with a love of stories. For while Chompo Bars will melt and disappear, those memories never will. Have you watched a book spread from one kid to the next? It starts with just one reader connecting to it, telling a friend about it - then that friend has to read it. A few more try it out. This spring, Wonder has our classrooms buzzing with excitement as kids pass it from friend to friend. This is a book that is truly reaching kids, speaking to them, making them think - think about friendship, about bullies and about what it means to be kind. Auggie feels just like an ordinary kid, but he knows that others don't see him that way. You see, Auggie was born with severe facial deformities that have required years of corrective surgeries. He's been homeschooled up until now, but his parents have decided that he's strong enough to try regular school. So beginning in 5th grade, he's starting at Beecher Prep. Right away, kids are drawn into Auggie's character. They can relate to having to start a new school, but they can also relate to showing Auggie around. How would you react when you meet someone for the first time whose face looks completely different than yours? And how would that affect the other person? Auggie's voice feels authentic and real. He's into Star Wars, he laughs at fart jokes, he notices everything other kids do, and he cracks really good jokes. He isn't perfect; he gets angry and justifiably so. But he's hopeful and yet realistic at the same time. 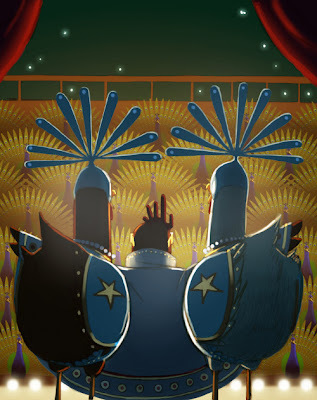 Palacio draws readers in by telling the story not only from Auggie's point of view, but also from his sister's perspective, Auggie's best friend's viewpoint, and others'. This shifting first person narrative keeps the reader involved, making them think about the characters all from different angles. It makes us feel like we're right there in school with Auggie. 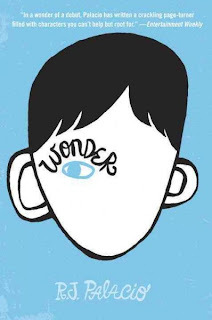 What struck me as I read Wonder, was the heart, the kindness at its core. I was left thinking, wondering about what it means to be a good friend, how we can stand up for others, how we can keep true to ourselves in the face of real difficulties. And really, what makes me so happy is that it's really reaching kids, that they're responding to it, thinking about how their actions affect others, thinking about what it means to be kind. Learn more about the story behind Wonder at R.J. Palacio's site and on this video interview with Ms. Palacio, shared by Mr. Schu at Watch.Connect.Read. There are many starred reviews, but two I particularly like are by Travis Jonker at 100 Scope Notes and by Anita Silvey at Children's Book-a-Day Almanac. I was also very moved by Jen's story at Teach Mentor Texts, sharing Wonder with her student, Michelle: Wonder reminds us that kindness that makes the world go round. The review copy was kindly sent by Random House, but I've since purchased several copies for friends and classrooms. This is a book that is meant to be shared. If you make a purchase using the Amazon links on this site, a small portion goes to Great Kid Books (at no cost to you!). Thank you for your support. The ocean has always fascinated me - listening to the sound of the ocean waves, exploring the crevices of tide pools, and learning about all the different animals that call the ocean home. So it was quite natural that I was drawn to Claire Nivola's newest book, Life in the Ocean: The story of oceanographer Sylvia Earle. But, wow, this book is just beautiful. It's a picture book biography that will draw in a wide range of children. It captures the story of a woman who pursued her passion for exploring the ocean, but also coveys the importance of taking care of our vast oceans. Sylvia Earle was drawn to the ocean when she moved to the Florida coast at the age of twelve, but she had always been fascinated by exploring and observing plants and animals all around her. The clear, warm waters of the Gulf of Mexico invited her to explore the fascinating life that filled the underwater world. Sylvia started exploring the world's ocean and soon realized that she wanted to keep diving deeper and seeing more. "Take the humpback whale, forty feet long and weighing 80,000 pounds, who, on the first day of a three-month whale study, swam straight at her (Sylvia), like a freight train bearing down on a mouse. Moments before the collision, the whale swerved gracefully, tilting her great head to look into Sylvia's eyes with her own 'grapefruit-size' eyes as she slid past inches away at high speed." Earle describes these giants, saying, "Whales are like swallows ... like otters ... They move in any direction... They are sleek and elegant and gorgeous." 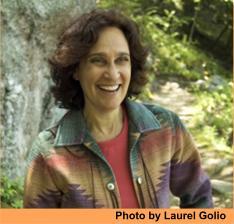 Nivola effectively weaves in Earle's own observations from journals and notebooks. While this biography does not go through Earle's life in a chronological fashion, it captures her passion and mission in life perfectly. Throughout, Nivola's illustrations combine a sense of the vastness of the water, the changing hues of its color, and the rich variety of life in the ocean. 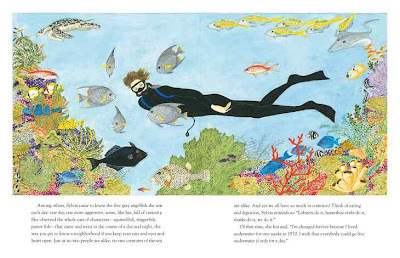 Her watercolor drawings convey the quiet stillness of underwater dives and the way that human divers are observers visiting these different environs. 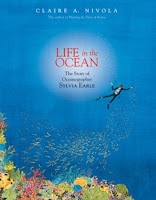 Readers will take from this biography a sense of the vast array of wildlife living in the world's oceans. But more than that, they will take away some of Sylvia Earle's amazement at the wonders of the ocean, the importance of learning all we can about the life beneath the surface, and the belief that we all must care and take care of the world's oceans. For other reviews, check out: The Nonfiction Detectives, Shelf-employed, Kirkus Reviews and Waking Braincells. The review copy was kindly sent by Farrar Straus Giroux / Macmillan Kids. If you make a purchase using the Amazon links on this site, a small portion goes to Great Kid Books (at no cost to you!). Thank you for your support. Bad Kitty for President, by Nick Bruel (ages 8 - 11) - kid tested, kid approved! Bad Kitty is one of the most popular series at our school. Kids from 2nd through 5th grade love Nick Bruel's wacky humor and hilarious cartoons. But did you know that all of the Bad Kitty books blend different sorts of facts and information throughout them? Yep, Uncle Murray pops in throughout with his helpful facts. This newest Bad Kitty book continues the trend, and it's been kid tested and kid approved in our library. The Neighborhood Cat Coalition is set to elect their president and Old Kitty has decided to step down. Annoyed by the stray cats in the neighborhood, Bad Kitty springs into action when she realizes the potential power that can come with elected office. The kitties’ campaigns follow the American electoral process, and so Bruel incorporates information about campaigning, fund-raising, media and debates throughout. Although the information is solid, the tone is always witty and full of word play. At first, I was worried that there was too much information about elections and politics for kids' tastes. While some of the in-depth facts may go over the heads of younger readers, the best comment came from one fourth grader: "Yeah, I didn't really know what grassroots campaigns meant, but I talked about it with my mom." Isn't that great?! 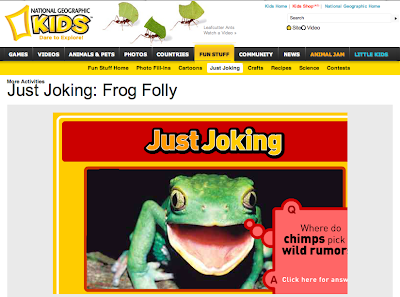 The humor and illustrations draw kids in, and they have fun with all the facts and information. Definitely get this book to share for laughs, but also for conversation starters about elections, the process, and all the mess that politicians can stir up. Bad Kitty is definitely kid tested and kid approved. Bad Kitty Meets the Baby just won the 2012 Children's Choice Book Award for 3rd and 4th graders last week. My kids are definitely glad that Bad Kitty is getting the attention she deserves! The review copy was kindly sent by Roaring Brook / Macmillan Kids to my local review group, the Association of Children's Librarians. Check out ACL's new blog Bay Views and More for the newest information on children's literature, with a northern California slant! If you make a purchase using the Amazon links on this site, a small portion goes to Great Kid Books (at no cost to you!). Thank you for your support. Kids love books that make them laugh, and older kids love books with puns, jokes and goofy action. But they also want a story arc to a book, a bigger feeling, a reason to read the story. 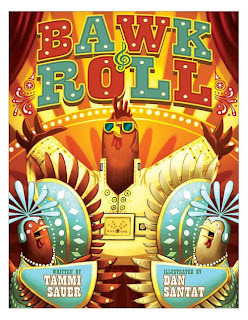 You'll get all this and more in Bawk & Roll, the newest book by the crooning duo Tammi Sauer and Dan Santat. Marge and Lola can't believe how their dreams have come true. 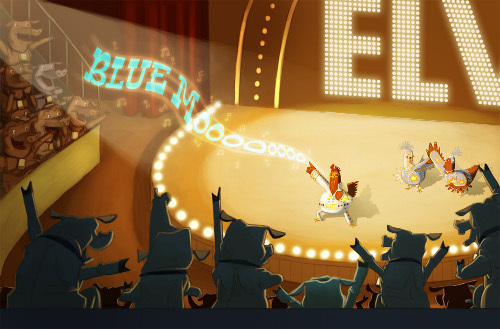 Superstar singer Elvis Poultry has asked them to be backup singers on his rock and roll tour. Their chicken dance rocked the house at the talent show in Sauer and Santat's previous book, Chicken Dance. But when the lights come on and Elvis parades in front of the cheering crowd, stage fright strikes - these chickens get cold feet. Marge and Lola are down for the count and are sure nothing can help them. At each new venue, they try something new to calm their nerves, but nothing works! What are a pair of nervous hens to do? But then, they realize they're missing the most important thing of all - the support of their friends. 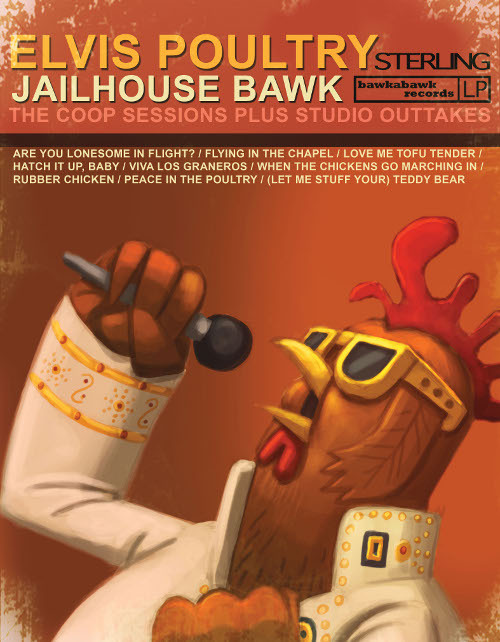 So "the chickens crossed the road" (to mail a letter) and invite their barnyard friends to the next concert. As the concert starts, everyone is cheering for Elvis. But then they hear, "We love you, chickens! ... Let's see your mooooooooves!" Thrilled with the audience's support, Elvis immediately comes up with a new hit song: "Blue Moooooooo" - Marge and Lola are thrilled. Kids love the fast pace, the constant puns and dynamic illustrations. Sauer layers the puns and jokes liberally, and while many refer to Elvis, not all do. Kids will laugh at imagining the audience in their tightie whities and watching Elvis parachute onto the stage. 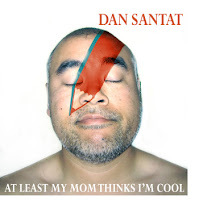 Santat's vibrant illustrations, full of Vegas showbiz costumes and buffoonery, automatically draw kids to this story, but it's his details and unique perspectives that keep them coming back again and again. Just look at this back cover, modeled off an old record jacket. While this is a sequel to Sauer and Santat's Chicken Dance, you can have fun with it as a stand-alone or as a companion. If you like this, you'll certainly love Jarrett Krosoczka's Punk Farm and Punk Farm on Tour. 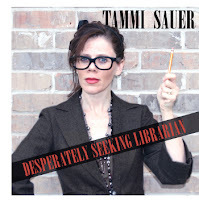 Tammi Sauer and Dan Santat certainly jive well together, each having plenty of fun. Don't you love the photos they took for the jacket flap? They both have a pile of books being published this year with other amazing authors and illustrators. Tammi Sauer is coming out with: Me Want a Pet!, illustrated by Bob Shea; Oh Nuts!, illustrated by Dan Krall; The Twelve Days of Christmas in Oklahoma, illustrated by Victoria Hutto; and Princess in Training, illustrated by Joe Berger (bold titles are forthcoming later this year, other links are to Amazon). For other reviews of Bawk and Roll, see Seven Impossible Things Before Breakfast, PinkMe and the Jean Little Library. 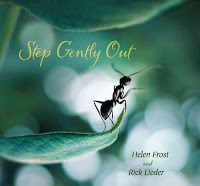 The review copy was kindly sent by Dan Santat and the publishers, Sterling Children's Books. Dan was a member of the Cybils Book App committee which I chaired. If you make a purchase using the Amazon links on this site, a small portion goes to Great Kid Books (at no cost to you!). Thank you for your support. 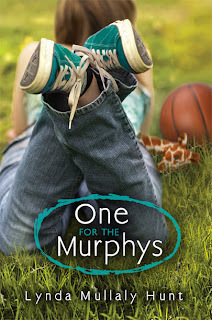 I'd love to welcome Lynda Mullaly Hunt, to celebrate her debut novel One for the Murphys (which I adore, just loved - see review here). I asked Lynda to reflect a bit about reading with her children. She's a lovely writer - enjoy! Well, instead of wearing my author hat, I’ve been asked to wear my mom hat and write about helping my own children develop a love of reading. What a fun job THAT was/is! My children were introduced to the world of books the way a fish is introduced to water. As babies, they chewed and drooled all over board books and then graduated into word books, touch and feel books, pop-up books, and picture books. We would do “snuggle time” as we called it, where we would run to the couch, get under a blanket, and read whatever pile they could carry over. As he got older, my son could carry a lot! We also, of course, read before bed. When they were toddlers, we attended three story times a week—one at the library and two at bookstores. And, let’s just say that I did my part to stimulate the publishing economy! Even though my children are teenagers now, their rooms are still overflowing with books. For holidays, they still receive books and B&N gift cards. In fact, we’re having to get creative about where to put bookshelves! Just this afternoon, my daughter bought herself a Nook. Perhaps, there will be more floor space in her room? When my daughter was young, she liked to write her own books, so I would fold paper and staple it. I’d write the words for her and she would draw the pictures. Oh, she loved those stories of hers. She would tell stories in the car, too, and we used to laugh that her stories would last as long as the car rides; she’d just keep adding conjunctions and keep on going! I still read aloud to my son. He is fourteen and I am reading The False Prince by Jennifer Nielsen to him before bed. I like to read and he still likes to listen, so it works for both of us. With my oldest preparing to leave for college in the fall, I find myself thinking back to those “snuggle time” days a lot lately. I can still feel their heads lean against me, the sound of sippy cups as I read, their chubby toddler hands resting on my arm, and I am so, so grateful that I took the time to do that when they were young. I did it for them—because as a teacher, I knew how important it was for them to grow up with books being an everyday part of life. I also knew, that when children sit on your lap to read books, they associate reading with something pleasant/positive and that feeling is something they carry in their cells right into adulthood. Besides, books are fun, aren't they?! But, the benefits for me as their mom are not something I will find in an educational journal. I tell you though—I wouldn’t trade the memories of snuggling in, the sound of childhood giggles while we shared the antics of Curious George, Mike Mulligan, Stellaluna, Tacky the Penguin, The Paperbag Princess or the zillions of other characters we grew to love together. It’s the kind of stuff you can’t put a price on—that is, until your daughter goes to college as an English major! Thank you, Lynda! Please see the full details of the One for the Murphys blog tour over at Lynda's blog. I sometimes find myself wondering, what does it mean to be a good mother? From a child's perspective, what does a mother do? Wash, iron, make lunches? No, I really don't think that's it. A mother's willing to fight for you, to stand up for you, to know when you're down and can stop to listen. 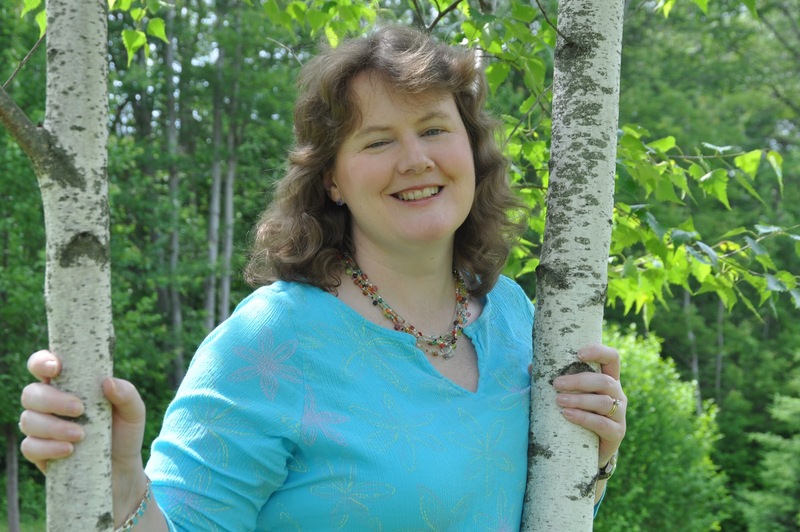 Lynda Mullaly Hunt's debut novel, One for the Murphys, will touch kids, perhaps make them cry, but it will also start them thinking. What does it mean to stand up for your family? I am excited to share One for the Murphys here today. 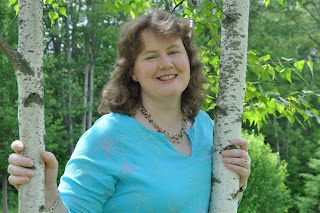 In a post later today, Lynda will share her own thoughts reading with her children. The sign of a good book? I want to start buying a copy for many of my friends (Talia, a copy is on it's way to you already!). “My fingers play with my hospital bracelet. I stare at my name. Carley Connors. Thirteen letters. How unlucky can one person be?” Thirteen-year old Carley Connors works hard to keep her feelings completely hidden in order to protect herself. After all, her mother taught her how to be street smart and tough on the streets of Vegas. But her step-father has beaten her terribly, and now, Carley finds herself taken from her mother. There’s so much anger swirling around inside Carley that she can’t let herself get close to her foster family, the Murphy’s. And yet, she finds herself watching this loving family, struggling to understand their unconditional love, and longing to be part of their family. Little Michael Eric is the first to connect with Carley, with his innocent superhero play, but Mrs. Murphy’s patience and knowing love do finally reach through. As Carley’s caustic exterior starts to soften, she starts to understand what it means to belong - until her own mother decides that she wants Carley back. Debut novelist Lynda Mullaly Hunt creates fully realized characters, with authentic first person narrative and snappy dialog. This is not a story with easy answers. By the end, readers will celebrate Carley’s strength and growth, even as they struggle with the difficult path she has in front of her. Visit Great Kid Books tomorrow to read a lovely guest post by Lynda, reflecting on her own experiences reading with her children. See Lynda's blog for a full schedule of the One for the Murphys blog tour. The review copy was kindly sent by the publishers, Nancy Paulsen Books / Penguin. If you make a purchase using the Amazon links on this site, a small portion goes to Great Kid Books (at no cost to you!). Thank you for your support. In celebration of the publication of Minette's Feast, I asked the author Susanna Reich to share some of her memories growing up reading with her parents. Reading this brought back so many memories for me, and reminded me of all we give our children sharing that time together, reading together and talking about what books mean to us. Reading wasn’t limited to bedtime. My brother and I devoured books all day long—literally and figuratively. Our Little Golden Books must’ve been bought when we were still in diapers, for our copies of Seven Little Postmen, The Poky Little Puppy and Five Little Firemen were extremely well-chewed. Fairy tales were part of our diet, too. I especially loved our edition of Hans Christian Andersen’s The Swineherd and The Tinder Box, illustrated by Gustav Hjortlund and translated by R.P. Keigwin. We also read poetry, and I took great pride in being able to recite many of the poems in A.A. Milne’s Now We Are Six. The first book I read on my own was The Cat in the Hat, by Dr. Seuss. I memorized it first, then spoke it aloud as I turned the pages. Eventually, the mysterious black marks on the page began to take on meaning as letters and words. I began reading on my own and fell in love with Astrid Lindgren’s Pippi Longstocking, A.A. Milne’s Winnie the Pooh and, later, Madeleine L’Engle’s A Wrinkle in Time and J.R.R. Tolkien’s Lord of the Rings. I also read comic books, maps, series fiction like Nancy Drew and The Hardy Boys, and nonfiction, especially books about dance. We visited the public library regularly, returning home with our arms weighed down by stacks of books. My parents modeled reading, as well. Mommy spent hours at her desk, reading scholarly books related to her work as a teacher and music historian. Daddy, after a long day in the physics lab, would settle into a comfy chair after supper and disappear behind the New York Times or Scientific American. My parents subscribed to Life magazine, and I “read” the pictures before I could read the words. We got The New Yorker, too, and by twelve I was reading it cover to cover. There weren’t many YA books back then, so at that point I moved on to books for adults and never looked back. There’s no guarantee that if you read to your child, take her to the library, and model reading for her, she will become an author. But this much I know: books and reading can endow her with knowledge, imagination, a good vocabulary—and strong arms! Thank you so much, Susanna! Your memories really bring me back to days when I used to escape behind the couch, lost in my favorite book, hiding from everyone else in my family. The books we read when we are young really do leave a lasting impression. Free giveaway of Minette's Feast! 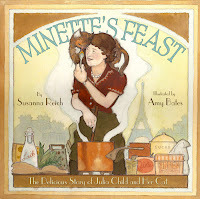 Susanna is offering to give away a free copy of Minette's Feast. To enter your name in a drawing to win a free, signed copy of Minette's Feast, please email Susanna with the subject line "Minette's Feast giveaway." One entry per person, please. Winners will be selected at random on May 31. 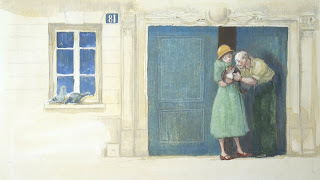 Please read more about Minette's Feast at my review here, and make sure to stop by other blogs celebrating this delightful book. For more information on the Minette's Feast blog tour, head over to Susanna's site. If you make a purchase using the Amazon links on this site, a small portion goes to Great Kid Books (at no cost to you!). Thank you for your support. Here's something not many people know: when I was young, I used to tell my favorite cat all my secrets and troubles because I knew that he would never tell anyone else. You see, cats are wonderful companions - as many children know. Susanna Reich brings readers into the world of Julia Child's years in Paris through the eyes of her cat, Minette. 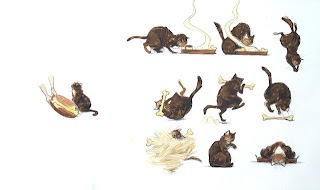 It is a book that children will relate to, loving it as a cat story and learning about Julia Child at the same time. "Une maison sans chat, c'est la vie sans soleil!" "A house without a cat is like life without sunshine!" And so Minette joins Julia and Paul, taking long naps, enjoying soft laps and especially finding special treats to eat. "How delightful the crunch of fresh-caught mouse, devoured on the living room rug!" As Julia takes cooking classes at Le Cordon Bleu, the famous French cooking school, Minette perfects her hunting skills. Minette will delight young children with the way she pounces, jumps and rolls around the Child's home, with the way she waits patiently as Julia cooks special meals. Susanna Reich shares the story of Julia Child in a way that both provides interesting information and a way into the story for children. All of the quotes in the story are drawn from Julia Child's writing and correspondence. Amy Bates' watercolor and pencil illustrations capture Minette's warmth and playfulness perfectly. Head over to Amy Bates' website to see more of her artwork from this story. The review copy was kindly sent by the publishers, Abrams Books. If you make a purchase using the Amazon links on this site, a small portion goes to Great Kid Books (at no cost to you!). Thank you for your support. What kid doesn't love a good knock-knock joke? I mean, you get to read it over and over again to your friends, family, brothers and sisters - anyone who will listen! I have seen kids pour over joke books, reading them again and again. Our students are LOVING this new collection from National Geographic Kids. It's full of hilarious animal photographs, bright colors and jokes they're telling all their friends. With bright photographs of animals and a jazzy design, this book is sure to appeal to kids. 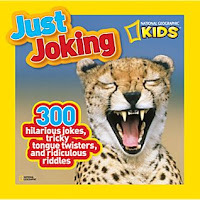 Based on the “Just Joking” department in the National Geographic Kids Magazine, this collection include knock knock jokes, tongue twisters and riddles. "Knock, knock. Who's there? Ben. Ben who? Ben knocking on the door all afternoon!" "Knock, knock. Who's there? Annie. Annie who? Annie body home?" "Knock, knock. Who's there? Isabel. Isabel who? Isabel working? I've been ringing it for hours." The jokes do not relate to the animal photographs, so this collection is better for 2nd and 3rd graders who do not need picture support to get the jokes. Animal facts are sprinkled throughout in a much smaller font, and do relate to the animal photographs. Since the animal photographs are part of the book’s draw, this is a nice addition. The librarian in me was very happy that there's a thorough index sorted according to type of joke - what a great way to get kids to use an index! Do you have a favorite joke book you like to share with your kids? We'd love to hear about great ones to add to our library collection. The review copy was kindly sent by the publishers, National Geographic. We have also bought a copy for our home collection (great to bring out to dinner and distract the kids!). If you make a purchase using the Amazon links on this site, a small portion goes to Great Kid Books (at no cost to you!). Thank you for your support.